Halla Mohieddeen is taking up the role having worked in China and France for the past decade. The anchor of the flagship news programme on Scotland's new channel, STV2, has been announced. 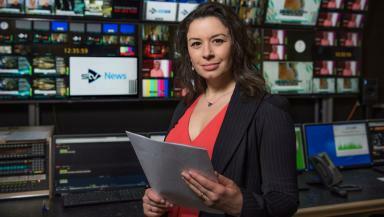 Halla Mohieddeen will lead the new STV News Tonight show having spent the last ten years working in China and France. Ms Mohieddeen was the presenter of the Morning News and Middle East Matters programmes for Paris-based 24 hour international news channel, France 24. The Heriot-Watt University graduate from the Scottish Borders has also worked for a number of Chinese TV and radio stations, including CCTV, Xinhua News Network Corporation and Beijing Radio 774. The new half hour 7pm weeknight programme will be produced using STV and ITV News resources and aims to offer a comprehensive service of Scottish, UK and international news from a Scottish perspective. Ms Mohieddeen said: "STV News Tonight is a unique way to bring the news to Scottish audiences. It's an exciting project which I am very proud to be a part of. "I'm thrilled to be returning to Scotland to anchor the show live from Glasgow." STV's existing city TV channels for Glasgow and Edinburgh will be rebranded and combined with three new licences for Aberdeen, Ayr and Dundee under one distinct brand, STV2. Bobby Hain, director of channels at STV, said: "The launch of STV2 has created a number of new opportunities, particularly within the news team, including the appointment of Halla Mohieddeen to anchor the channel's flagship news programme. "STV News Tonight is a fantastic opportunity to bring consumers in Scotland more choice with a nightly news programme that combines Scottish, UK and international news while complementing STV's existing schedule of bulletins."